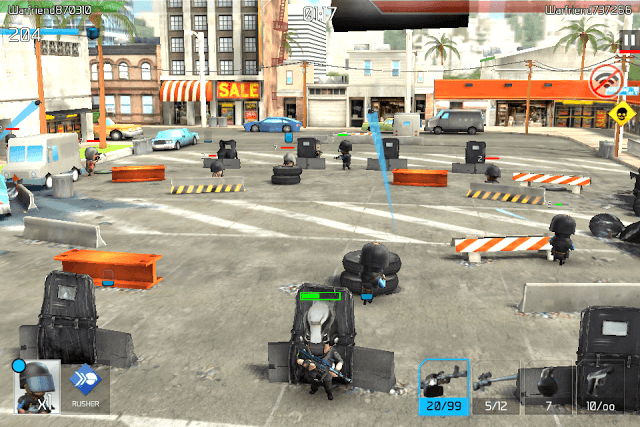 Warfriends is a stunning tactical combat game. The game’s close quarters PvP matches pits you against a random human player. Armed with an assault rifle, sniper rifle, explosives and a handgun, you will have to use your shooting skills and some tactics to kill your opponent before he eliminates you. In almost all battles, I have noticed that my opponents were killed by grenadiers. While this is just my observation and in future I may come across far advanced units that would deal more damage than a grenadier does, but one thing is certain – grenadiers can really be helpful as they try their best to destroy your opponent’s shield, making him run like a chicken from one shield to another. A grenadier belongs to the explosive class and should be immediately deployed when you spot one in the available units section at the bottom-left corner of the game screen. A grenadier/sniper combo can kill your opponent faster. A grenadier will try his best to rip through his defenses and a sniper will try to take down his target when your opponent moves from one shield to another. Snipers attack enemy player from a distance and they don’t miss their targets. Don’t let enemy units settle down. Kill them before they hide behind barricades and start attacking you or your enemy units. Enemy units usually arrive from the corners so start shooting when you see them running towards barricades. The best way to kill them swiftly is to press and hold down your finger on them to auto-fire. When reloading your weapon, you may throw a grenade towards them if enemy units keep coming from the corners. Remember that you will need energy to deploy more army units and what’s better than eliminating a few of them at the start of play to get some more energy. Note: Beware of snipers while shooting at enemy units. Your opponent may deploy multiple snipers so that whenever your character peeps from his barricade, they will hit him. A sniper shot reduces HP considerably. While shooting enemy soldiers and the leader, keep an eye on grenades thrown at you. Grenadiers will toss grenades at your shields to destroy it. If destroyed, your character will be exposed to enemy shooter units. When a grenade lands near a shield or anywhere close to you, it won’t explode immediately. A red grenade icon will show up. Quickly swipe left or right to the next shield when you spot a red grenade icon close to you. While shooting and deploying soldiers, pay attention to “rusher” units like shotgunners and paratroopers. The latter can silently sneak into your territory and attack you from a close range. Rusher units usually have high HP than other units. It won’t be easy for your starter Defender units to stop them from infiltrating your territory. When you spot one, start attacking him until he falls down. You may lob a grenade or two to kill him if you can’t eliminate him using an assault rifle. You win a match if your opponent gets killed in battle. Of 4 unit types in your squad, 3 unit types will focus on your opponent, so there’s really no need to attack him. If you target your opponent instead of his units, you will be easy target for his soldiers because your character peeps from his shield to attack enemies. Let your units do the job, while you attack enemy units to collect energy so that you can deploy more units. Focus on attacking enemy units and try to eliminate them before they take cover. Enemy units usually start arriving from the corners so don’t let them settle down. Deploy grenadier, followed by snipers and machine gunners. They will focus on your opponent and try their best to destroy his shield and shoot from a distance. Don’t forget to drop defender units as they will assist you in eliminating enemy units. Explosives (red and white barrels) are scattered all around enemy territory. Target an explosive when you spot 2 or three enemy units close to it. Hitting an explosive with just 1 enemy unit beside it will be a sheer waste of an opportunity. It’s a fast-paced PvP game and so your priority should be to target units. You may occasionally target an explosive barrel by holding down on it if there is more than one enemy unit close to it. Training your soldiers will give you an edge in battle. Training increases attributes such as Attack, Health etc. and increases your unit’s “power”. Before a battle starts, a squad comparison screen shows both your unit and your opponent unit’s powers. Green numbers indicate that your soldiers have better stats (Health, Attack etc.) and will fare better than your enemy units in battle. Red numbers suggest that your opponent’s soldiers have better stats than your units. Your objective is to train your soldiers frequently so that most soldiers in your squad have higher “power” than your enemy’s units to increase your chances of winning a battle. But you will have to be patient as it will take a few minutes to train a soldier. Also remember that another soldier can’t be trained until you have finished training your current soldier. You can use gold bars to instantly train your units. Training soldiers also fills the “Tier” bar little by little. You can see this golden bar in the “My Army” section, beside each unit’s portrait at the bottom of the screen. Keep training your soldier until the bar hits the second star. When it touches the second star, you will have to promote him to a tier by reaching a certain rank. Reaching a star kind of maxes out a soldier’s level and he can be promoted to the next tier when you reach a certain rank. When your soldier reaches a tier, you unlock one of his special abilities. For example: When Your Infantry reaches tier 2, you unlock his “Healing Aura” ability. This special ability will allow him to heal nearby friendly soldiers for 4 percent of the infantry health per second. Upgrading a weapon boosts its stats and raises its overall “power”. Try to have a higher weapon power than your opponent’s weapon power by upgrading it. A stats comparison screen before battle compares your weapon’s power with your opponent’s weapon stats. Chances of winning are more if more number of weapons has higher power than your opponent’s weapons. 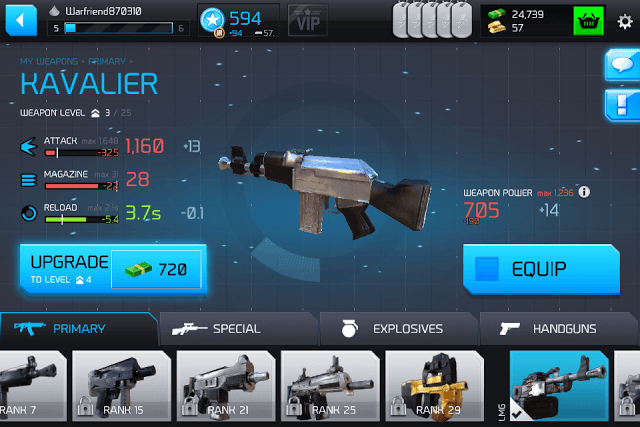 Upgrading your primary weapon, an assault rifle, will increase attack, bullet count and decrease reload time. Upgrading your special weapon, a sniper rifle, will increase attack, magazine and decrease reload time. Upgrading explosives will increase attack, the number of explosives you can take to battle and decrease the reload time. Upgrading Handguns will increase attack stats, magazine and decrease reload time. Rushers: They quickly run towards your opponent and try to eliminate him by firing from a close range. Shotgunner, Paratrooper, Swap Trooper, Flamethrower and Commando are examples of Rusher units. Shooters: They fire from a distance and target your opponent. Machine gunner, Sniper Soldier, Cobra (chopper), Predator (armored transporter) and Minigunner are Shooters. Defenders: They defend you from enemy units, so deploy them if you want energy quickly. Infantry, Drone (Very useful), Engineer (builds turrets that eliminate enemy units), Orca (chopper) and Armored Humvee are all Defenders. Explosive units: They target your opponent’s shields. Grenadier, Bazooka Trooper, Armored Buggy, Jetpack Elite and Titan belong to the “Explosive” class. When you connect with your Facebook account, you not only get 25 gold bars, but also enjoy 24 hours of free VIP benefits, which include 50 percent extra XP after completing a match, 50 percent extra war bucks, 2x loot boxes every 4 hours and 2 extra dog tags. Along with VIP benefits, you will also receive login bonuses on certain days. For example: For the month of January, day 3 login reward will be doubled if you have connected the game with your Facebook account. Your character’s helmet/accessories and the character type won’t have any effect on your damage/health. You can customize your character by equipping him with helmets and accessories or try a new character type, but don’t expect any changes in damage/health of your character. Loot boxes usually contain helmet parts/character parts. Keep playing and winning to increase your rank bar, which can be found at the upper-left corner of the screen. The XP you collect after winning a battle fills the rank bar and once full, your health will increase, the barricades or shields that protect your character will become stronger and your war cards will also become more powerful. You may also unlock new units, weapons, gold bars and your dog tags (in-game energy) will also be refilled. Win battles and get more medals to advance to better leagues. This will let you earn more bucks as league bonuses after winning a match. Join a squad to get 50 gold bars instantly. Keep playing Warfriends daily and you may get some really cool rewards, such as cash, gold bar or maybe a war card. If you have just started, then try to complete the “Starter Assignment” to get an advanced weapon, gold card pack, lots of cash, a cool helmet and a health power band. You will have to complete all 10 starter assignments within the stipulated time to get special rewards. You will also get rewards after completing each assignment.